Let us start at the very beginning — with a lemonade stand. The story starts with a little girl named Alexandra “Alex” Scott. Just before her first birthday, Alex’s parents were given the diagnosis that Alex had neuroblastoma, a type of childhood cancer. This is my favorite time of year — the warm weather has arrived, daylight is lasting just a little bit longer each day and the flavors of the season are in abundance. I truly get excited when the pineapples are put out on display at my local produce market because that means it’s salsa time! 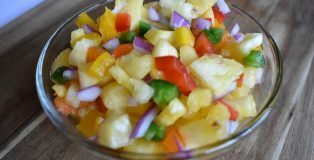 Since Cinco de Mayo is here, I felt there was no better time than now to make my favorite spicy pineapple salsa. This time, I’m throwing in a little twist with this fresh dip. My secret ingredient — mango habanero cider! Quinn. Riley. Skylar. It sounds like a millennial roll call. Well, in this case, it is the winter storm roll call of 2018. 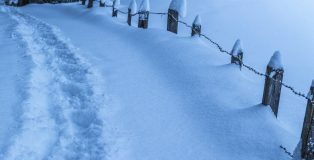 If you live on the East Coast and you have looked outside lately, or if you enjoy watching The Weather Channel as much as my mom does, then you have seen the craziness of weather slamming the Northeast U.S. 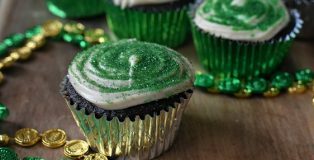 There are many dishes that have come to represent St. Patrick’s Day. From shepherd’s pie to soda bread, colcannon to boxty’s, these forms of Irish fare exemplify the simplistic nature of living off of the crops and the land in Ireland. 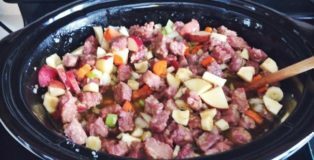 There is one dish that stands out in many people’s minds as being the epitome of true Irish cooking; corned beef. National Bittersweet Chocolate Day came and went this past January 10. Were you aware of this national holiday? No? Tragic. Fear not, however, for it is never too late to take part in the celebration with your favorite confectionery. When you think of the holidays, what memories come to mind? I think of the smell of fresh-baked chocolate chip cookies with burnt edges because my mom left them in the oven too long. I remember the Christmas presents constantly needing protection from our 100-pound Golden Retriever, who had a particular proclivity for shaking and tearing the wrapping paper off the gifts like he was hunting live game. Most of all, I love bringing fresh, delicious flavors of the season to all of the holiday festivities, for everyone to try. 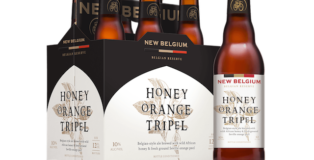 This year, I have found my beverage of choice for our new annual Christmas party beer sampling – New Belgium Brewing’s delicious Honey Orange Tripel. “As any swalwe sittynge on a berne. Therto she koude skippe and make game, As any kyde or calf folwynge his dame. Hir mouth was sweete as bragot or the meeth, Or hoord of apples leyd in hey heeth.” – The Miller’s Tale, from the Canterbury Tales. The Pottstown Brew Fest is back for another year of celebrating craft beer, wine, cider, food and great music. 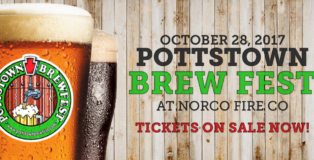 The award-winning fest is returning to Pottstown Saturday, October 28 but it will be held at a new location — the Norco Fire Company. 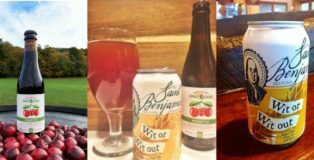 From 12-4:30 p.m., guests can sample beer and cider from some of the finest craft brewers in the Mid-Atlantic region and from across the United States. 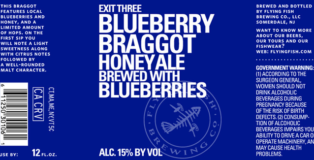 Experimental flavors, quality products, great taste: these are all elements that consumers don’t just seek out, but expect it in their craft beer. With summer upon us, consumers want refreshing ingredients and lots of flavors! 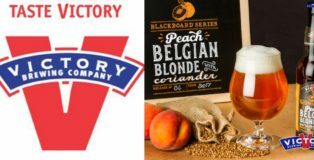 One company who delivers upon these standards for the craft is Victory Brewing Company. Sometimes, I just have a tough time making decisions, especially when it comes to what beer I want to try (I know, I know, #firstworldproblems. I hear your sympathetic violins). However, when a beer menu presents you with 15 choices, but your flight only allows for four beers, and the waitress is just staring at you because you can’t decide, it becomes an issue. So when I saw a cocktail of a kriek and a tripel, both of which I wanted to try, I thought “Genius!”(The cocktail was delightful, by the way). It’s summer though, and I want to keep it light & refreshing. I decided to find a kriek and a witbier that complimented each other’s flavors and was super refreshing. Envision this: a Berliner weisse made with 300 pounds of beets. 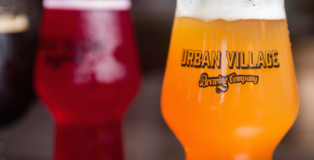 It is as strange and tasty as it sounds, and it is one of the varieties of brews available at Philly’s newest brewpub, Urban Village Brewing Company. Opened to the public as of June 1, Urban Village Brewing is a part of a myriad of storefronts opening in the Northern Liberties section of Philadelphia, creating life for this up-and-coming neighborhood. In a city with a booming restaurant scene, Urban Village sets itself apart with its quaint ambiance and quality beer. There is a bar in Philadelphia that makes the most amazing burgers. Good Dog Bar has a burger called ‘Good Dog’. This is a juicy 1/2 lb.of meat, where every salty bite is filled with gooey Roquefort cheese is then topped with fried onions. Am I making you hungry yet? 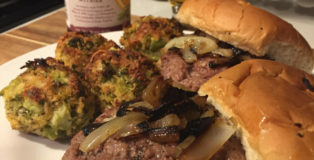 Since I don’t live within a reasonable distance of Good Dog Bar to obtain one of these tasty morsels regularly (which is probably a good thing), I decided to recreate this burger with my own twist: beer. Instinct told me to go with a darker selection, but I defied my better senses and went with a surprisingly delicious choice. Memorial Day weekend signifies the unofficial beginning of summer. Barbecues, parties and parades represent a few traditions that Americans look forward to during this three-day holiday. 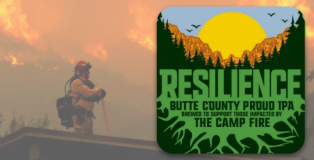 A new Memorial Day weekend tradition of mine is joining my boyfriend’s family on their annual weekend-long camping excursion. Not just any camping trip, though — this is legitimate redneck camping. 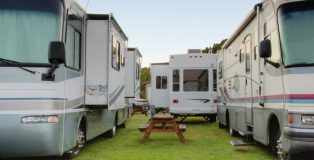 Campers travel in droves to the campground and park in Northeast Pennsylvania. Trailers, patio lights, lawn chairs (sometimes the random couch) and plenty of beer cans decorated each campsite, in true backwoods fashion. So, what is more appropriate than creating a cocktail as resourceful as the people I watched create an elevated camper by putting a tent on their truck bed? (Boom. Bed.) Though I do enjoy the classical version of a Moscow Mule, I was low on supplies in the woods and needed to get creative. 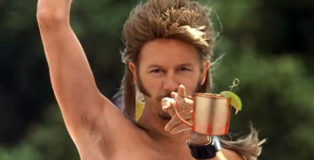 So, with a beer and a dream, I created the Redneck Mule; a mix of beer and vodka and a bad idea. 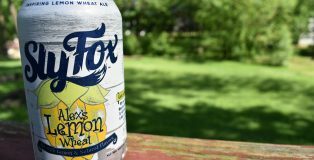 Part beer, part ginger beer and part vodka, I wanted to create something light, yet citrusy, so I wanted to pick a beer that offered me both. 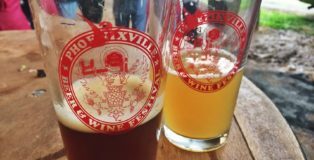 Even the forecast for a Nor’easter couldn’t keep the spirits down at the first annual Phoenixville Beer and Wine Festival in Phoenixville, Pennsylvania. Despite the wind and the rain, the masses descended upon the rain-soaked Kimberton Fairgrounds to attend the sold-out event with raincoats and umbrellas in tow. 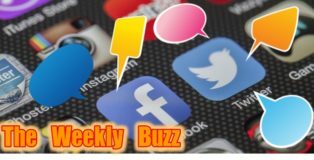 Twenty-six craft breweries, along with multiple cideries, wineries, distillers and meaderies came to show off their creations for the thirsty crowd. Grilling season is upon us, ladies and gentlemen!! Many will agree that there are few things better than a solid cookout. If your grill skills are a bit rusty, let me help you get back on track. I like taking my food up a notch by creating some great marinades and sauces to accompany my grilled creation. 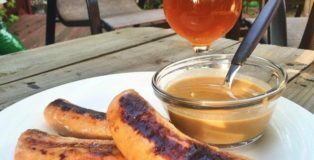 So, when I wanted to make a spicy honey mustard for some bratwurst, I knew that we could make this amazing! With what you ask? Well, clearly with beer. 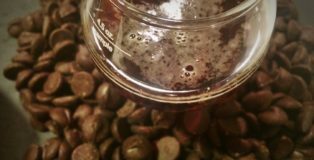 When it comes to making beer mustard, darker beers add more depth and flavor, so feel free to experiment with whatever you have on hand. My choice was a lonesome can I had lingering amongst the onslaught of new spring beers and this was a perfect choice! 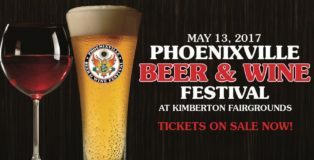 Featured image courtesy of phoenixvillebeerwinefestival.com.